I'm glad to report that with 13 Millions voxel the graphic card is not even stressed (the cpu and system ram, however, is). If you're interested in parallel computing on the JVM you might be interested in the programming language Clojure. what do you mean by the gpu isnt stressed ? can you rotate the whole bunch of dots ?! 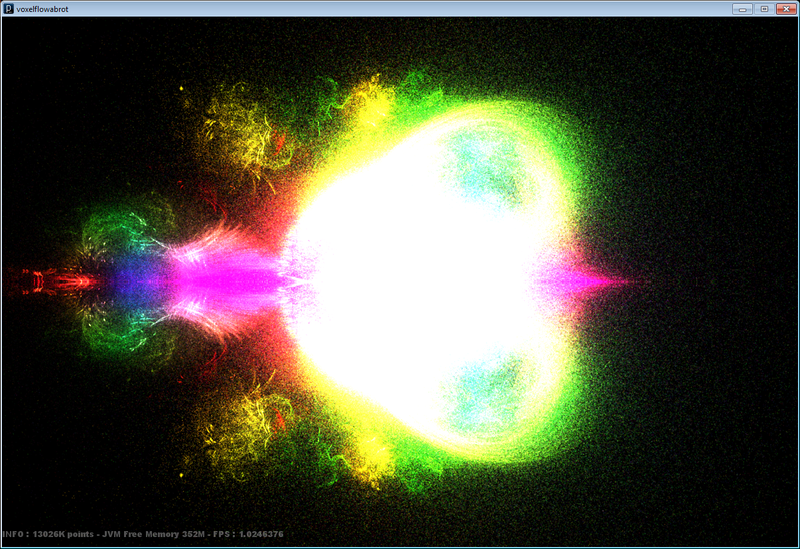 Well, not stressed because the Cpu is the bottleneck and the gpu have no problem displaying this at ~1FPS. However, if i stop the computation then the gfx card will try to display it as fast as possible and, of course, will stress. wow, that's awesome and beautiful! Ooooooooooold stuff. I'm planning to rewrite this. I was searching if there was any progress with 3D buddhabrot and all i can find is my own stuff.